My tickets arrived in the post yesterday, very pleased. this year a couple of friends are joining us. Funny last Hollies concert I went to here they asked why didn't I tell them I was going as they would have wanted to come, well this time they are going to see the magic of the Hollies for a first time. Hi Anthony, I am sure many of us here in the UK will be wishing we could be at the concert with you and your friends next February! Not long till the Australian Tour. Hope you enjoy Anthony! I'm sure you will. I'm very envious - The Hollies don't seem to do the UK these days. Just a note to them - the Fairfield Halls in Croydon has been closed for refurbishment for the last 3 years, but it's opening again in September this year - Hollies please come back! First a message for Dawn - by my reckoning the Hollies tour in the UK approximately every 18 months which must mean we are due for a tour this Autumn. I don't see any dates on the Frontm3n website for any of their concerts in September October or November so Peter should be free. (ps it would be good to have them tour here). I am a little concerned for Peter though as he has just finished a lengthy tour in Germany and has to be in Perth in the next few days. At least there should be sunshine to cheer them all up. Wishing everyone attending the concerts in Australia and New Zealand a great time and no trouble travelling to the theatres. Please send us some reports as we are getting withdrawal symptons over here! Just to ease your withdrawl symptoms Emily, the Perth audience gave The Hollies a very warm and rowdy welcome. I always feel they look so energised as it is the first show, and they look like a group on guys on holiday together. I'm so sorry that I don't have a set list but although my husband and I are lucky enough to see them in other cities, we just don't see them often enough. I spent the show just enjoying the moment. We are in Sydney at the moment for the show tomorrow night and then in Melbourne for the show on Wednesday. I will endeavour to write down the set list if Anthony doesn't beat me to it. As an aside, I work for Qantas at Perth Airport and was proud that Tony mentioned our direct London to Perth service. I'm on holidays at the moment, so sadly wasn't available to drive in the airbridge and open the aircraft door for them. Hi Emily, yes, I'm hoping for an Autumn tour this year. I think they do Kilworth House open air show every other year, so hopefully that will happen. I was visiting a friend this weekend, who went with me to the last Kilworth show in July 2017. We were talking about it just as we went into a supermarket, and as we walked in the door, on cue, Carrie Anne started playing over the intercom system! It must be a sign! Nice to hear from redcloud that all was good for the first show in Australia. Post subject: Brisbane Concert Friday 22nd. What an amazing coincidence. Fifty years since the golden days of the "Imperial Ballroom Nelson" and the "Cavendish club Blackburn when I lived in Clitheroe. 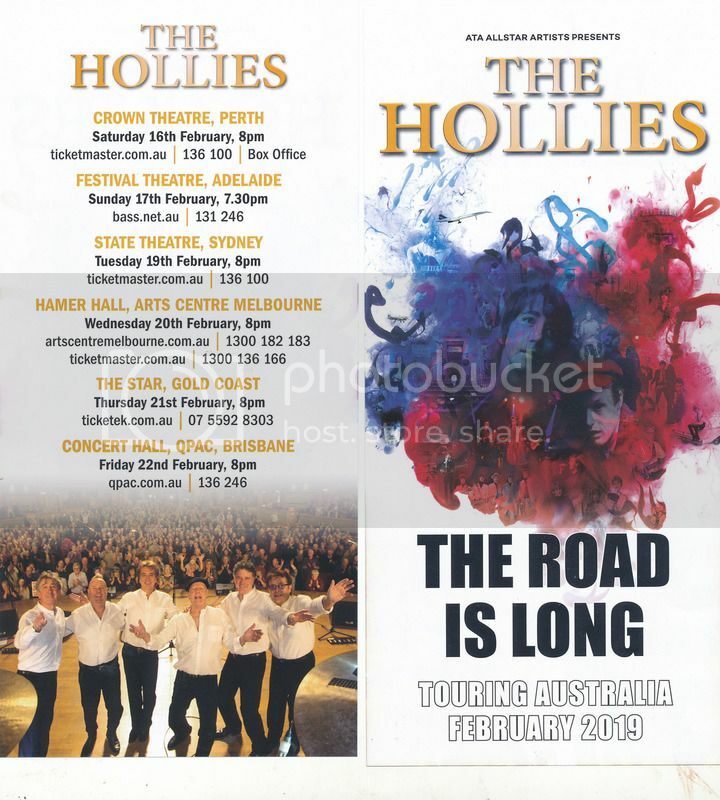 Now quite by chance as I holiday with my daughter in Brisbane the Hollies appear as if by magic at the Performing Arts Complex. What a lucky guy am I, so looking forward to Friday night taking me back to those brilliant days. Mysterious forces at work here!! Hope you have a great time at the Brisbane show. magical night here in Melbourne, the group was in top form. I saw the boys last Sunday. Wonderful! I was four rows from the front and on the side, so I as able to get up and dance on the side-aisle without getting in anyone's way to Stop Stop Stop. I HAVEN'T BELLY-DANCED IN 20 YEARS! I still managed and I think Peter liked it. He hasn't seen me do it before. Alas I didn't get to meet them afterwards. The theatre is still under construction in some parts, one being the stage door. But to see them again is the main thing. I hope to have time to write a review. I don't have as much free time these days with working longer hours and Jemima getting older. Due to busy schedule I haven't had time to visit the site as much as I used to. So it is only today that I saw the article about Eric. I will write a post to pay my respects. Post subject: Re: Brisbane Concert Friday 22nd. I often wonder what you thought of the current band - please let us know!